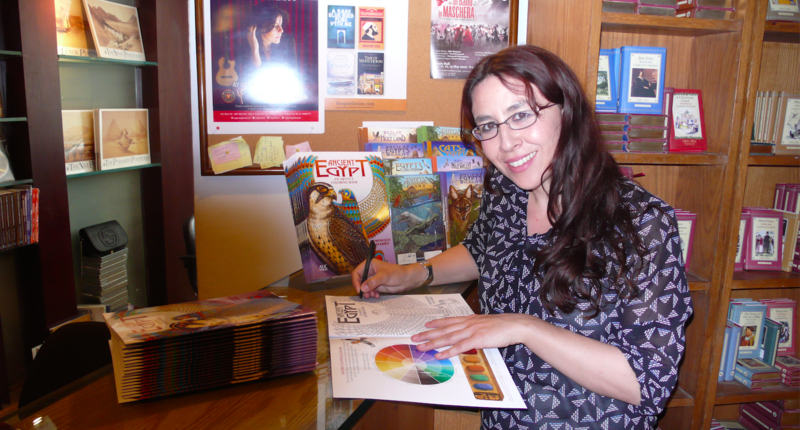 Signing Books at the AUC Press Tahrir Bookstore — Signed Copies of “Ancient Egypt; An Artist’s Coloring Book” Now Available! 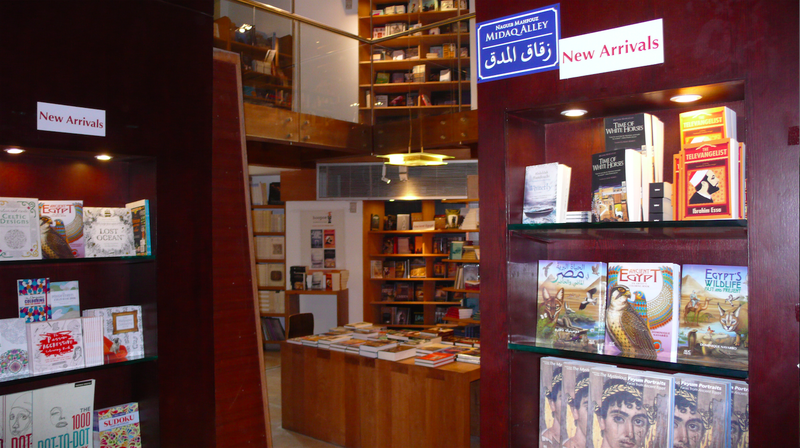 Had the great pleasure of signing books today at the AUC Press Tahrir Bookstore. 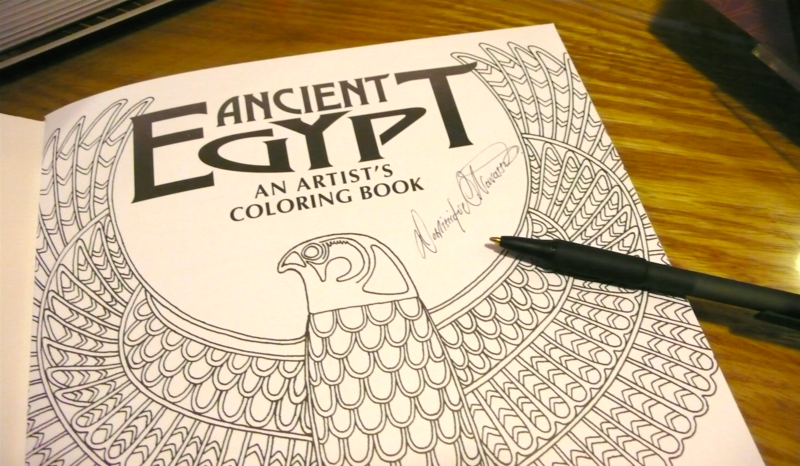 They are well stocked with the new “Ancient Egypt; An Artist’s Coloring Book” and signed copies are now available in the store! 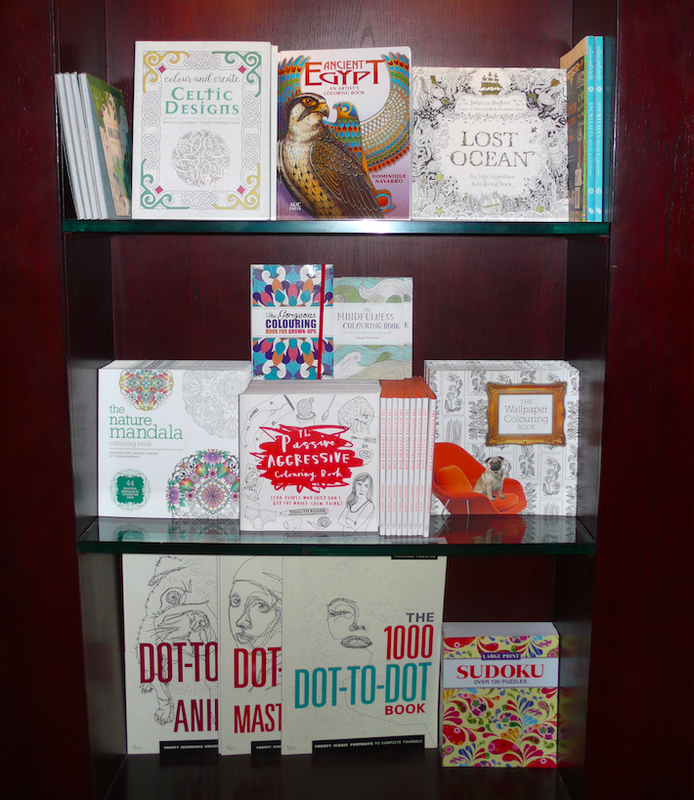 Along with the coloring book, all the AUC Press Nature Foldouts are also available at the register. 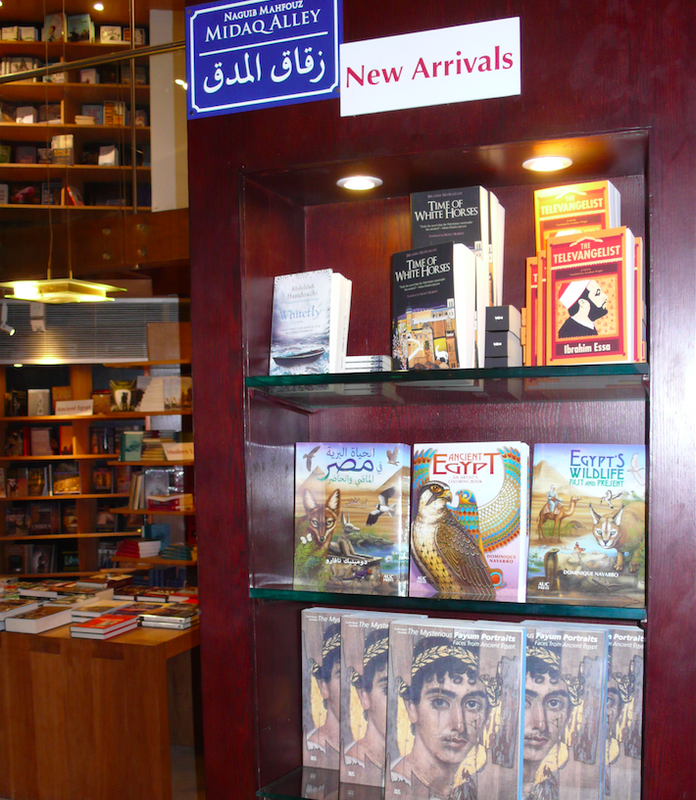 You can also find the coloring book in the “New Arrivals” display in the store, along with “Egypt’s Wildlife, Past & Present” in English and Arabic. Wonderful to see “Ancient Egypt; An Artist’s Coloring Book” alongside some of the bestselling adult coloring books on the market. It definitely stands out! EXTRA! EXTRA! The American Scientist Magazine http://www.americanscientist.org/ May–June 2015 Issue is HOT off the press and available for your reading pleasure! 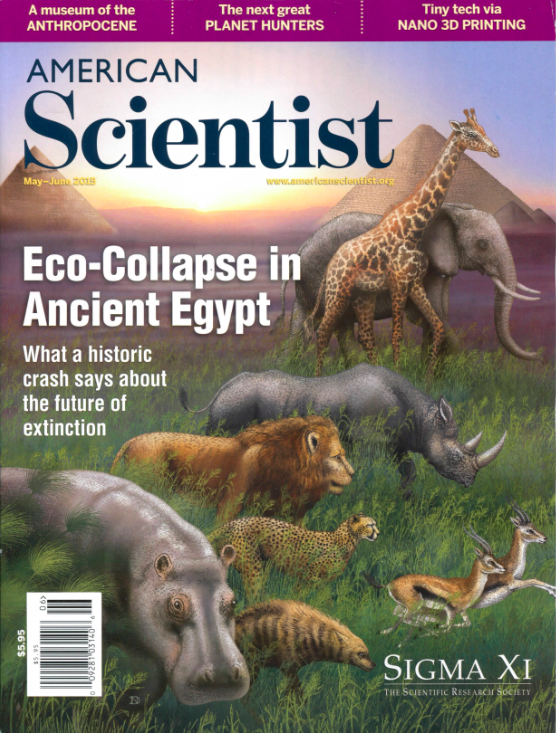 In this exciting issue you’ll find the cover article, illustrated by Dominique Navarro, “Modern Lessons from Ancient Food Webs” that discusses the decline in species diversity of larger-bodied mammals present before, during, and after the rise of agricultural societies in ancient Egypt and other areas. 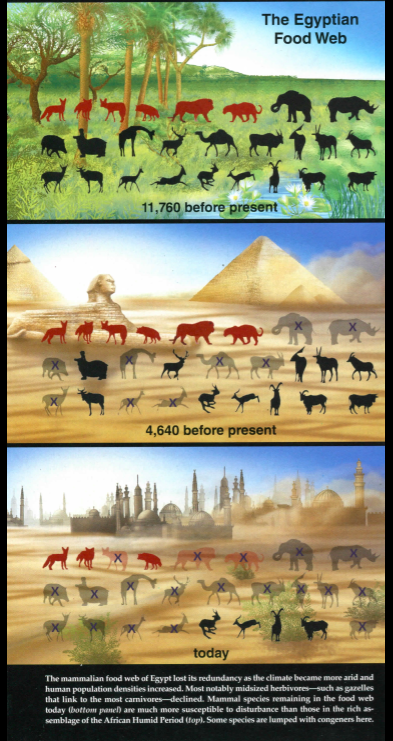 The assemblage of mammals in Egypt has declined in species diversity over the past 10,000 years. Using clues from archaeology and paleontology, ecologists have pieced together the food web of larger-bodied mammals present before, during, and after the rise of agricultural societies in ancient Egypt. In “Modern Lessons from Ancient Food Webs”, Justin D. Yeakel and Jennifer A. Dunne describe the underlying structure that appears to be consistent in food webs across space and time, as well as how we can better predict their instability or recovery after major die-offs. American Scientist is the illustrative, award-winning magazine of Sigma Xi, The Scientific Research Society and is your source of science, technology and engineering news and features since 1913! Visit the website at http://www.americanscientist.org. from American University in Cairo Press. The AUC Press NatureFoldouts are illustrated foldout guides introducing an exciting selection of Egypt’s animals and plants, from river wetland residents and desert survivors, to venerated animals of the ancients and prehistoric dinosaurs.Available from online booksellers including AUCPress.com and Amazon.com. 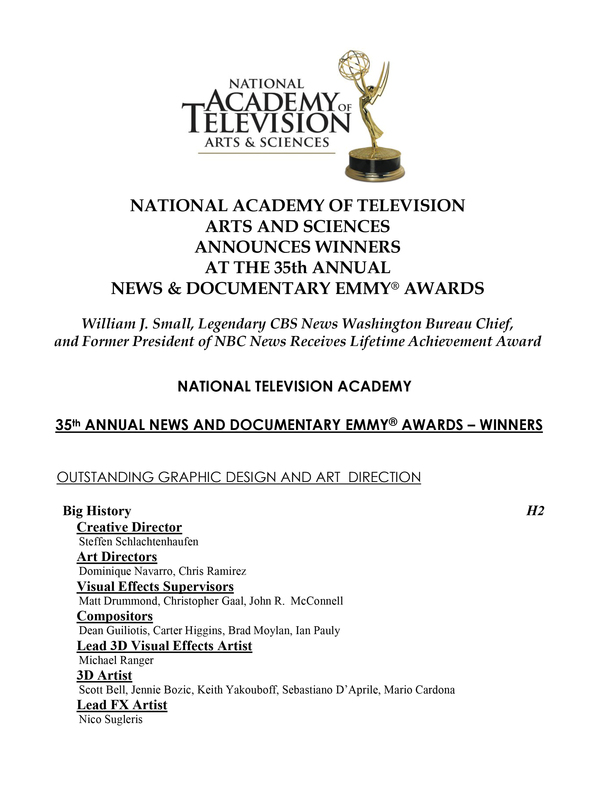 Natural history artist, writer, and art director Dominique Navarro was awarded an Emmy for Outstanding Art Direction (2014) for the TV series ‘Big History’ at last month’s 35th Annual News & Documentary Emmy Awards in New York City. 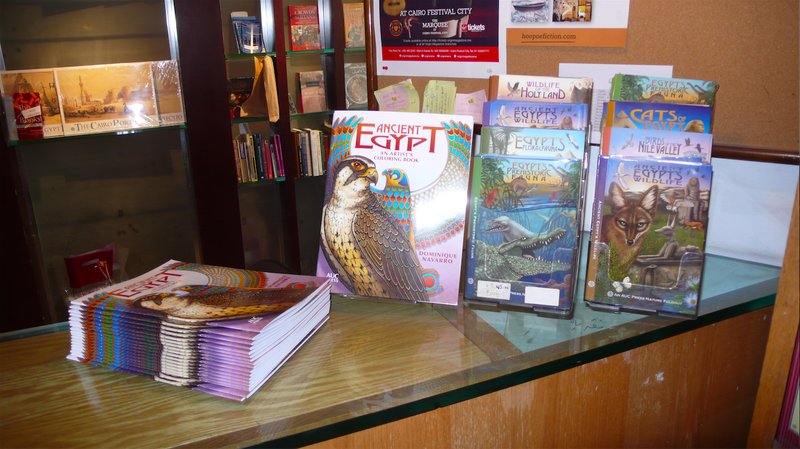 The recent Emmy winner is the author and illustrator of the AUC Press Nature Foldout series for Egypt; Ancient Egypt’s Wildlife, with Salima Ikram (2013), Birds of the Nile Valley, with John Wyatt (2013), Cats of Egypt, with Richard Hoath (forthcoming), Egypt’s Flora and Fauna, with Richard Hoath (2013), Egypt’s Prehistoric Fauna, with Matthew Lamanna (2013), and finally Wildlife of the Holy Land, with Sherif Baha El Din (forthcoming). 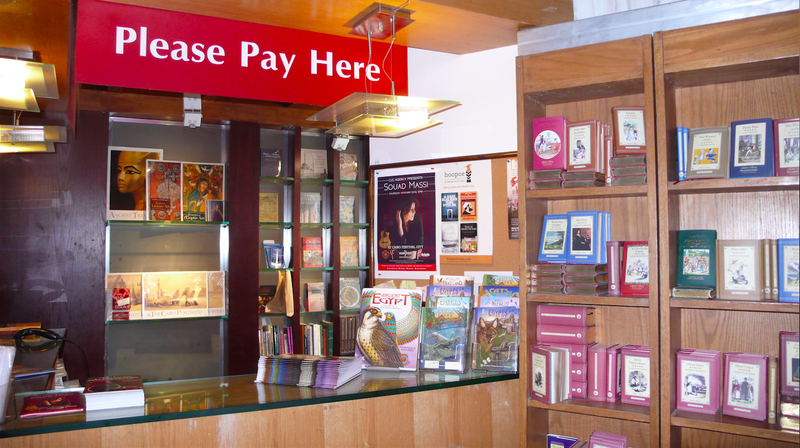 The AUC Press Nature Foldouts are available in the AUC Press Bookstores and can be ordered through the AUC Press website. To buy them on Amazon, click here. “The AUC Press Nature Foldouts have been my passion for the last few years, allowing me the opportunity to work with naturalist and other scientists on a project that hopes to inspire a positive appreciation toward the environment and Egypt’s natural heritage for generations to come,” said Navarro. The AUC Press 2015 calendar Cats, Crocodiles, and Camels is also now available. The full-color illustrations representing scenes of Egypt’s ancient and modern wildlife are by Dominique Navarro. ‘Big History,’ an H2 History Channel series produced by Flight 33 Productions, chooses familiar subjects—such as salt, horses, gold, ice, gravity, coffee, or weapons—and looks at their influence on civilization and technology throughout the history of humankind. Navarro has worked for over a decade as an art director in the documentary and film industry for programs featured on the History Channel, Discovery and National Geographic. As a trained forensic artist, Navarro also collaborates with law enforcement to create composite sketches from witness and victim descriptions. Her expertise has led to her work in Egypt at the excavation of a 25th Dynasty tomb where she created facial reconstructions from mummies as well as tomb diagrams and epigraphic studies. You can follow Dominique Navarro on her blog, website, and on Facebook. Dominique Navarro has always been passionate about art, science and non-fiction storytelling. Navarro, a UCLA School of Arts graduate, has worked with talent that includes Wim Wenders and Mikhail Baryshnikov; assisted in the excavation of the 25th Dynasty tomb in Egypt and created a series of field guides for Egyptian flora and fauna; and has served as a forensic artist creating composite sketches for law enforcement. But she has primarily focused on art directing documentaries, including the History Channel’s documentary series “Big History,” which earned her an Emmy award earlier this month. “My colleagues and I won for Outstanding Graphic Design & Art Direction for ‘Big History,’ a History Channel H2 television series,” Navarro said to the Malibu Surfside News. The documentary series is part of a bigger endeavor created by Australian Professor David Christian, an advocate for a multidisciplinary approach to learning that includes the Big History Project, an online course and education model funded by Bill Gates. Navarro has had the opportunity to recreate ancient cuneiform tablets, Egyptian figurines and Aztec weapons. Prior to her work on “Big History,” Navarro art directed “North Mission Road,” a documentary series about the Los Angeles County Coroner’s Department. Navarro said that the series inspired her freelance work as a forensic artist creating composite sketches for law enforcement from victim and witness descriptions. She has also used her art background as a tool for pursuing another passion, Egyptology. “In 2011, the summer after the revolution in Egypt, I worked at an excavation of a 25th Dynasty (760 BC TO 656 BC) temple tomb,” Navarro said. “Living near Luxor and the Valley of the Kings for two months, I was captivated by the natural environment: the birds, plants, and animals. But it was quite a challenge to figure out what any of the species were; nobody seemed to know what fish swim in the Nile, or what birds migrate overhead, or what the foxes are in the desert. I also quickly learned that I wasn’t the only one who wanted to know these things and to learn more about Egypt’s natural history. The US Forest Service has funded translation of the guides into Arabic. “Egypt has a growing environmental community that is really dedicated to the preservation of its natural heritage, and so it is wonderful to be a part of that effort,” Navarro said. In addition to her projects at the History Channel, she’s also worked as an art director on history and science based documentary programs for Discovery, the Weather Channel and National Geographic. “I’m shocked and so grateful for wonderful assignments and an amazing team of people who I have been blessed to work with since 2007,” Navarro said. For more information on Navarro’s work as an artist and art director visit, http://www.dominiquenavarro.com. Dominique Navarro—artist and author of the AUC Press Nature Foldout series—won an Emmy Award for her work as art director on the History Channel (H2) series, BIG HISTORY. The 35th Annual News & Documentary Emmy Awards ceremony was held in New York, at the Jazz at the Lincoln Center, on September 30, 2014. Navarro and her colleagues won for Outstanding Graphic Design & Art Direction for Big History, a History Channel H2 television series. Big History is part of a bigger endeavor created by David Christian, while the Big History Project is an online course funded by Bill Gates. The television series, narrated by Bryan Cranston, explores a single topic—salt, horses, gold, ice, coffee, weapons, etc.—and its influence on civilization and technology throughout the history of humankind. Navarro art directed recreations ranging from prehistoric man to conquistadors, colonial times to modern combats. The series is produced by Flight 33 Productions, with whom Navarro has worked since 2007. The Big History series asks questions guaranteed to change the way you look at the past. What’s the connection between ancient Egyptian mummies and a modern ham and cheese sandwich? Did New York become America’s biggest city because of…salt? How does the sinking of the Titanic power your cell phone? By weaving science into the core of the human story, Big History takes familiar subjects and gives them a twist that will have you rethinking everything from the Big Bang to today’s headlines. The series creates an interconnected panorama of patterns and themes that links history to dozens of fields including astronomy, biology, chemistry, and geology. The first season ends with a two-hour finale that pulls everything we know about science and history into one grand narrative of the universe and us. 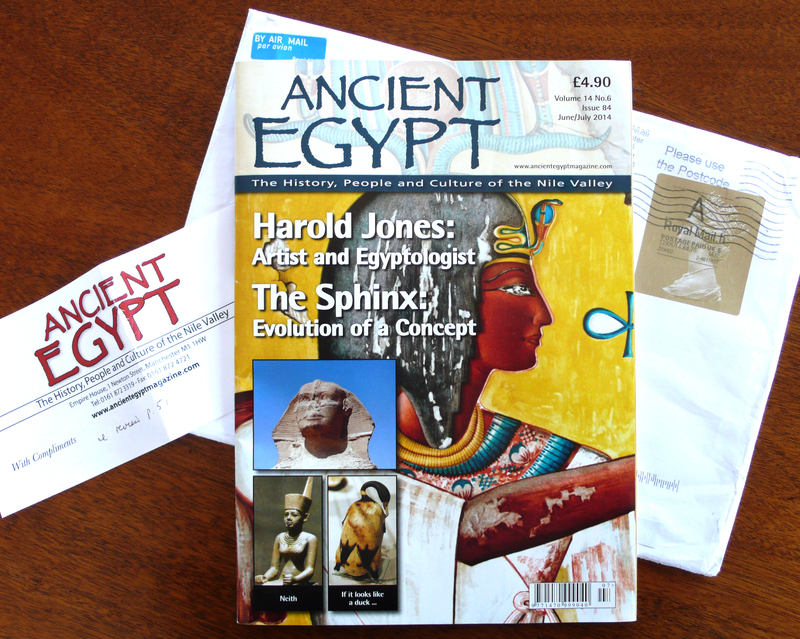 Very pleased to have my complimentary copy of Ancient Egypt Magazine arrive in the mail from England, so kindly sent by Deputy Editor Sarah Griffiths. Thanks to John Wyatt, who gave her copies of the AUC Press Nature Foldouts, Sarah included a book review of the foldouts—specifically the Birds of the Nile Valley— as well as further information on the other Nature Foldouts currently available. Ancient Egypt Magazine is an extrememly impressive publication out of England, filled with fantastic photography and the latest information on the world of Egyptology, including discoveries, excavations and research on the history of Egypt from Predynastic times to the modern era. Thanks so much to Sarah Griffiths and John Wyatt! 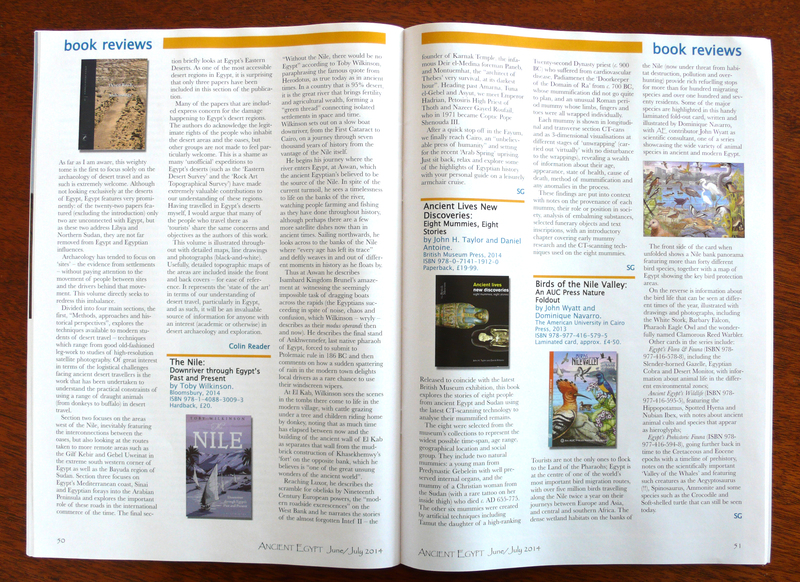 Richard Hoath’s Article in Egypt Today Magazine, with a Review of the AUC Press Nature Foldouts! Richard Hoath’s new article in Egypt Today Magazine about the state of the environment, and including an optimistic review of the Egypt’s AUC Press Nature Foldouts at the end! Thanks so much Richard! Have you ever wondered what the whale fossils in Fayoum’s Wadi Hitan would have looked like in real life? Not sure if that small swooping bird is a swift or a swallow? And just what is the significance of a giraffe in Pharaonic hieroglyphs? The answers to these and other cocktail party questions are found in a series of four Nature Foldouts published by AUC Press this year. More than just a mine of trivia answers, these four-panel guides all feature artist Dominique Navarro’s beautifully detailed color illustrations of Egypt’s native wildlife in natural settings. Young readers will find it hard not to be captivated by the gaping jaws of ancient carnivorous whales or the piercing stare of the Caracal. Parents will appreciate the factoids that make them seem like the smartest people in the world in the eyes of their children. With maps identifying the significant sites around the country, these foldouts are a starter kit to understanding Egypt’s natural heritage.